Although we’ve really haven’t had the greatest spring weather here in NY lately, we have had some really nice days here and there that have given us a real taste of what’s to come – warm days, lots of sunshine, and staying out later as the days get longer. My husband has started getting our outdoor space in good shape for the warmer weather, and I’m looking forward to dinners on the back deck and letting the kids play in the backyard before bedtime. I like spending time outside in the spring and summer, and I like to decorate and add accessories to our outdoor space that are functional and pretty. Our latest functional decorative piece is a really neat outdoor flameless candle from Candle Impressions. 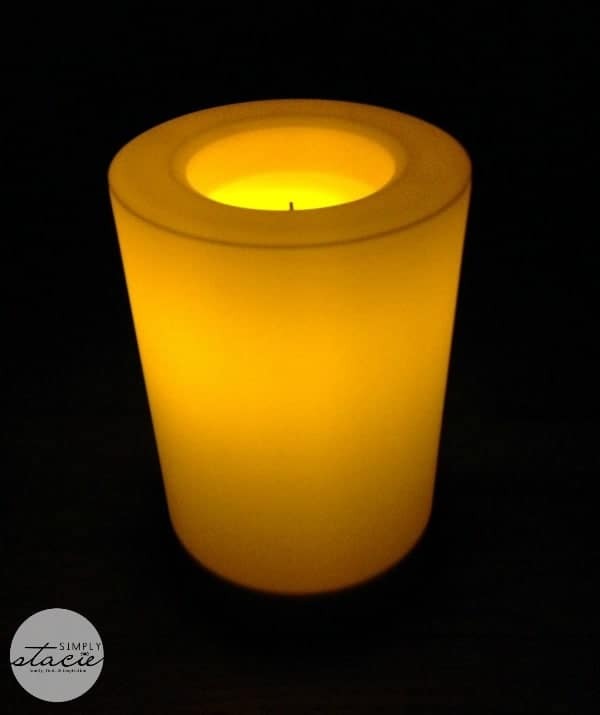 We received the latest offering from Candle Impressions for review – a 9″ Grande Outdoor Flameless Candle with Programmable Timer. 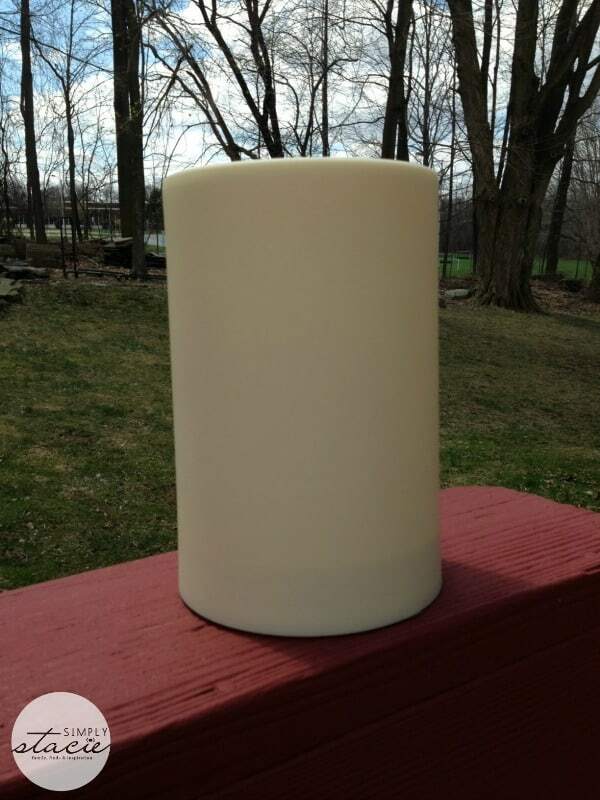 This candle is 6″ in diameter and 9″ tall, which I think is a great size for an outdoor candle. It’s weather-proof, so you can leave it out all season (the batteries are hidden in a weather-proof chamber so you don’t have to worry about that!). The timer function is pretty neat in that you can time it to stay on anywhere from 1 – 23 hours. The light is bright enough to use this candle as a lantern – I love the soft glow of it and it’s great to have a candle that glows so consistently and brightly. It looks great on my deck and what’s nice is that is looks just as good off as it does on. 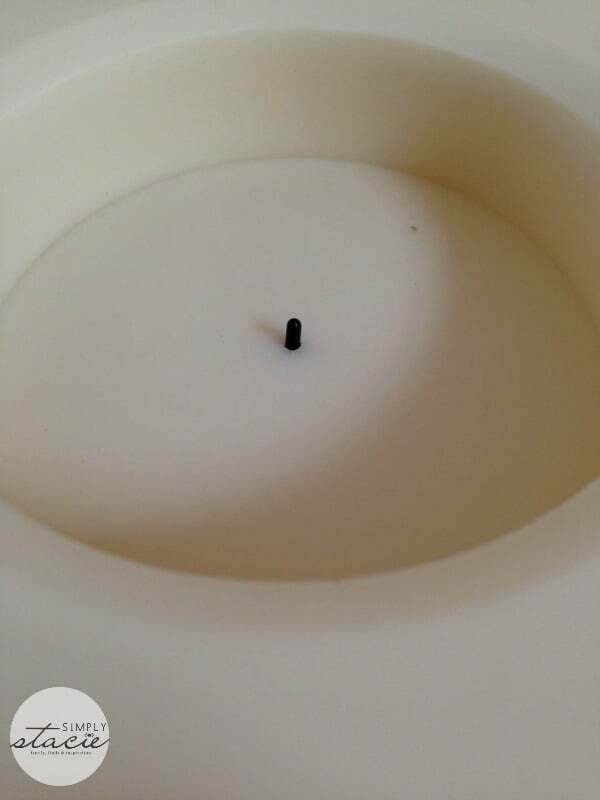 Candle Impressions has a patent on what’s called a “realistic wick design”, so they are the only candle company that can use the burnt-wick design that gives these candles such a genuine look. This particular design also comes in a 6″ and 12″ tall version, so I think a set of all three would be a great option for a tablescape for an outdoor dinner party, or even poolside for evening swimming. The 9″ candle that I received has an MSRP of $49.99, but is currently on sale at Lights.com for $32. You can also use their retail locator to find a retailer near you that sells the Candle Impressions line. Candle Impressions offers over 500 innovative products for every taste and budget. With industry-leading battery run times and their patented realistic wick design, you can count on the quality of every candle. Their candles are made to resist rain, heat, and wind, and offer neat features like programmable timers and remote controls. They offer a full line of candles for any of your decor needs – wall sconces, taper candles, tea lights, outdoor pillars, and more. You can see everything they have to offer on their website.